You may have noticed the recent headlines, or maybe you learned about it through your own bank: The end of free checking appears to be near. Still, it's not quite time for free checking's death-knell just yet. 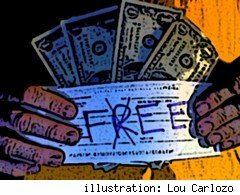 Despite the flood of questioning from news publications -- "Is free checking over?" -- and predictions from plenty of personal finance experts, if you take a look at WalletPop's "end-of-free-checking scorecard" below, the biggest banks seem to be continuing business as usual. At least for now. If you're curious how some larger banks handle free checking right now, here's the score. So read on, and get ready to make the Big Transfer to a new bank, if need be. Banks abandoning free checking. The big news here comes from San Francisco-based Wells Fargo. If you're an existing customer, you get to keep your free checking. But new customers will no longer be offered free checking accounts as of July 1. Of course, there's an exception or two: Customers who have opt for a direct deposit or a Wells Fargo mortgage will be allowed to waive that monthly fee -- in essence, they'll have free checking. Fifth Third Bank eliminated free checking for new customers last fall. It now charges $15 a month but will waive that fee if you make some pretty basic banking maneuvers, such as having direct deposit or using your debit card. TD Bank allows customers to have a free first year, but then it charges a $15 a month maintenance fee if balances fall below $100. Chase charges $6 a month -- but only if you don't receive direct deposits or make at least five consumer purchases against the account during each billing cycle. Citibank is charging between $7.50 and $9.50 a month for checking, depending on which state you live in. Some exemptions do apply, though, so check with Citibank to see if you are eligible to have fees waived. Regions has a $5 monthly fee. But here, as with many banks, you can avoid the fee if you sign up for some really simple things, like having your paycheck directly deposited in your account or conducting at least 15 electronic transactions a month. In other words, use the account regularly, and there's no fee. Banks that seem to be dipping their toe into the no-free-checking water. Bank of America was recently featured in The Wall Street Journal as a bank that's thinking of coming up with some new policies on free checking next year. But the bank has at least ruled out charging every customer a fee for free checking. Instead, starting next year, it's likely to offer a menu of options. Customers will be charged a maintenance fee, but if they use less-expensive self-service options like online banking or choose ATMs over tellers, they could probably avoid it. In other words, the less under-the-radar you are as a customer, or the more you use your debit and credit card, the more likely you are to avoid a maintenance fee. Of course, what this stalwart bank decides to do remains to be seen, but so far, it sounds like if you use your Bank of America checking account pretty regularly, you won't be charged a fee. Banks that seem prepared to keep free checking -- at least for now. The biggest is U.S. Bank. Teri Charest, a spokesperson for the bank recently interviewed by Forbes,didn't rule out the idea of U.S. Bank ending free checking, but she didn't exactly sound like it was happening any time soon when she said, "Our overall belief is that there will always be a way for customers at all income levels to have a checking account without a monthly maintenance fee." PNC Financial Services Group has also gone on record as keeping free checking for now. Banks that have publicly said they're not ending free checking.One large bank that has declared publicly that it isn't ending free checking is ING Direct. Jim Kelly, the bank's COO, vowed to Forbes that free checking wouldn't go away. That said: If free checking is going, it doesn't look like it's going very far. Geoff Williams is a frequent contributor to WalletPop and is the co-author of the bookLiving Well with Bad Credit. Tell us which pharmacy/drug store you love (or hate) and why. Your submission will be considered for inclusion in our article!